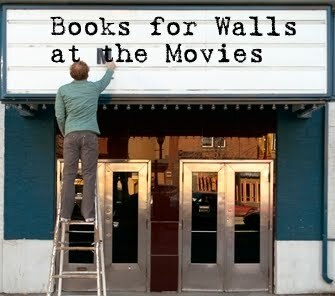 The Books for Walls Project: What's Happening! This weekend the Mom and the Big Sister did a lot of work on the site. We found new ways of posting, sharing and worked on our video (whoops there was edit --the Big Sister was frustrated that we cannot just upload an edited version to Youtube in place of the old version, but we realized that's a pretty important Youtube feature, so that folks cannot misrepresent videos.) Check out the latest edit of our video. Last week the Big Sister offered Share Thy Shakespeare Challenge, we learned so much from our readers --wow, you all love Shakespeare too, enjoy reading the comments and add your own! We watched the Shuttle Discovery land and learned that the pilot's school librarian helped him get started on his journey to the International Space Station. Thursday we explained our plan to follow Garrett Reisman on the latest Space Shuttle Mission to learn about books and reading in space. Friday we announced Book to Movie, which was fun for two reasons: one we just love movies and two we had a ball making our own little BFW's marquee! Thanks to ALL who shared their books and stories. Read all of the new comments and add your own! Remember you can take challenges more than once! Welcome Costa Rica and China. Country Count: 22, State Count: 31. Check out Covering the Globe. Coming Wednesday our newest Challenge, this week from the Dad. While we said we would announce the answer to the Haiku Riddle today. We just voted at breakfast and decided to leave it open, why not? If you are dying to know the answer, email us an we will tell you! Only 4 days left to vote in the poll --cast your vote! Announcing: in the next couple of weeks we'll be introducing you to some of our newest Regular Contributors --we'll post their Bio's soon! I bet by now you may recognize some of our regulars!